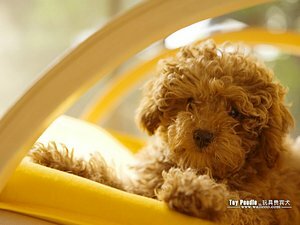 Miniature poodles are a result of selective breeding of standard or large poodles to breed a smaller poodle. Ideal size is approximately 15" tall and 12-15 lbs., with an extremely dense, curly coat. They can range in color from white to black and all shades of grey, as well as beige or apricot. Purebred miniature poodles will be solid color or mingled, but not spotted. Most purebred puppies will have their tails docked, giving it a distinctive, powder-puff appearance.